I am still in Texas after teaching last weekend at The Crafty Scrapper in Waxahachie. Carolyn Ross (the owner) and her team are ever so kind to work with! This is my 3rd year kicking off the holiday season of classes at her store. What a fun time we had making a project for Halloween, Thanksgiving and Christmas! Carolyn has a large classroom at the back of her store. On the back wall she has added wood/glass shadowboxes with every tag from the Tim Holtz 12 tag series that she personally made going back to the beginning, which I believe is 2008. She has a few more cases to fill before it's "ready for it's close up", but I'd say she is just about done (until Tim adds another tag inspiration on November 1st). Seriously, what dedication to the 12 tag series! If you have a chance to stop by and see the wall or take one of her 12 tag classes...DO! This one is mounted on silver Metallic Kraft-Core with added red cardstock and Yuletide paper. I cut a tree using the Festive Scribbles Thinlits from green cardstock then smeared Stickles Glitter Glue in Platinum over the top. 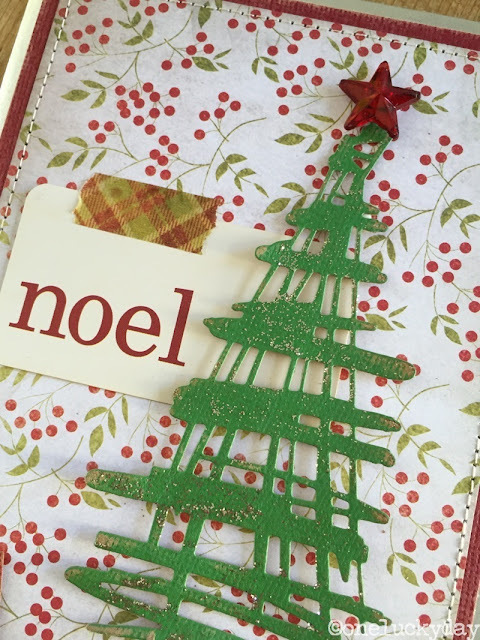 I used a piece of the plaid Design Tape (gotta love the plaid) to secure a Christmas Flash Card. 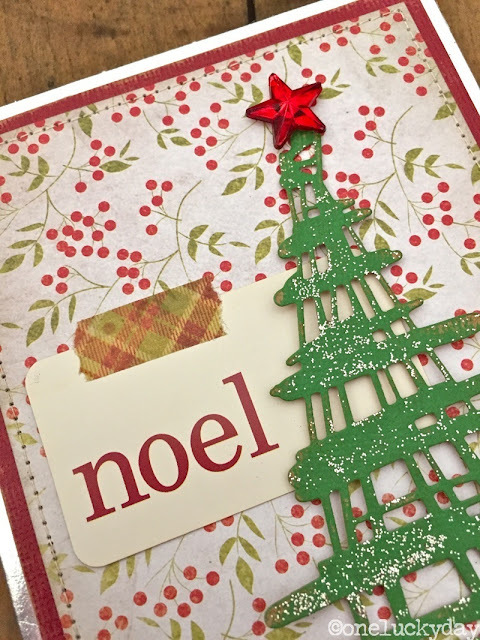 I cut thin strips of foam tape to raise the tree off the card front and added a Mirrored Star that had been colored with red Alcohol Ink. The second card changes up the color scheme to a wintry blue and silver. I colored a piece of Ranger Watercolor paper with Tumbled Glass Distress Stain. Once dry, I ran the paper trough the Vagabond machine with the "Sparkles" Texture Fade. 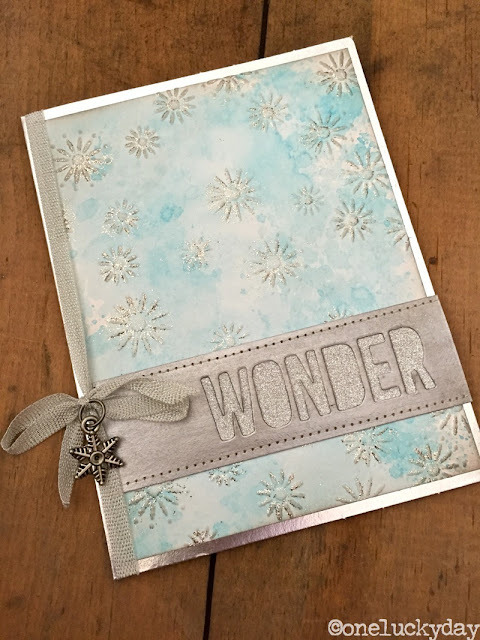 Again, I used Stickles Glitter Glue in Platinum to smear glitter over the starry raised images and create an added layer of texture to the card front. Once dry, I added the card front to a Metallic Kraft-Core card (they come in a pack). I cut the Holiday Words 2: Block (WONDER) from Manilla cardstock and painted it Silver with Distress Paint. 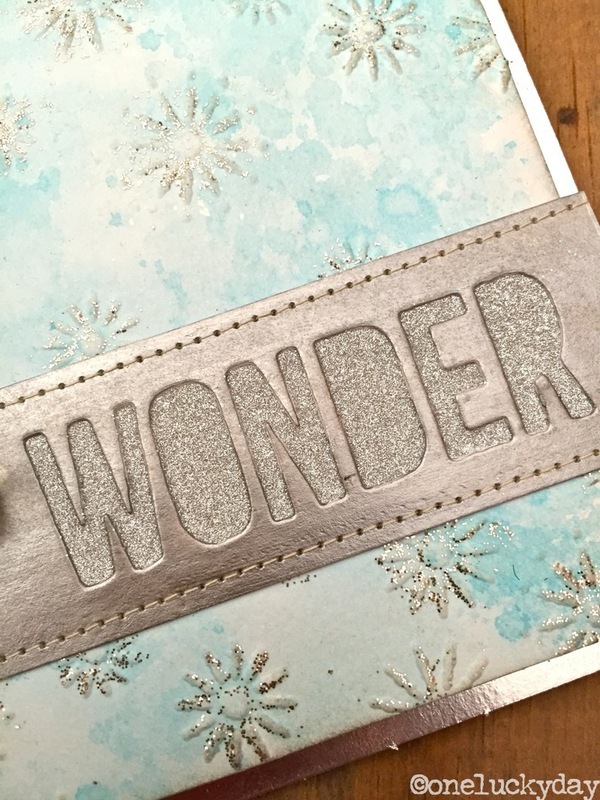 Once dry, I layered a strip of silver Deco Sheet underneath the word to fill in the letters with sparkle! Simple stitching to the card front gave it added interest. 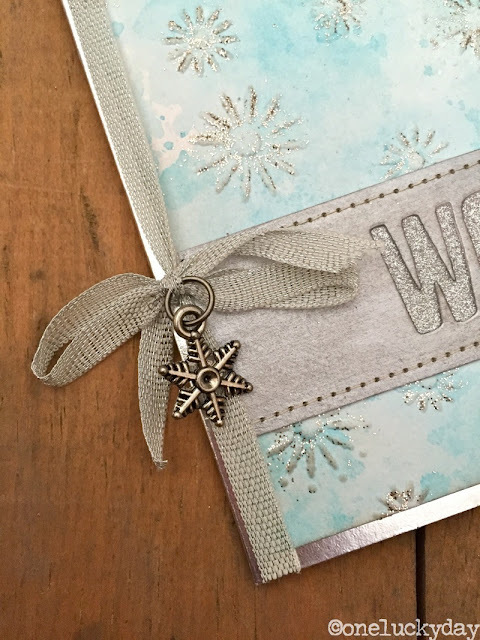 I finished the card with silver Metallic Trimmings (one of the favorite products from the Christmas Release) and a small snowflake. 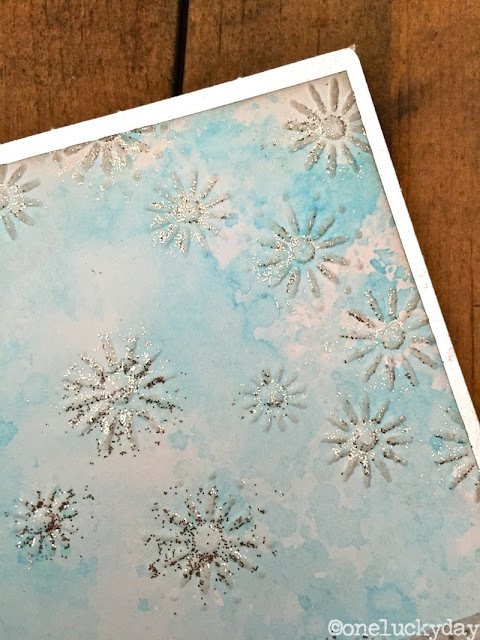 I hope you find some inspiration in these two cards - totally different color schemes but easy and fun to make! I am off to Houston tomorrow to meet up with Tim and Mario at Fall Quilt Market. We have a day to get the booth set up and two days of show to work the Eclectic Elements booth. I will be using Facebook and Instagram (luckyday) to post from the show so follow along for all the details! Beautiful cards! Can't wait for Quilt Market pics! Both cards are gorgeous, Paula. I love the scribbled tree, and I am swooning over the way you layered the Wonder. So festive! Simple, sparkle, and straightforward designs. Love the touch with the plaid design tape. Simple and pretty! TFS Paula! Can hardly wait to see your projects and Tim's new stuff! Have a blast! What I wouldn't give to have been there! Amazing wall of goodness and your cards are just beautiful! Love that Tim Tag display! Aaah ... Simple ... yet elegant in my book ! You make us want everything :) Love the plaid tape... actually I think I'm addicted to Tim's tapes , love the colors !! 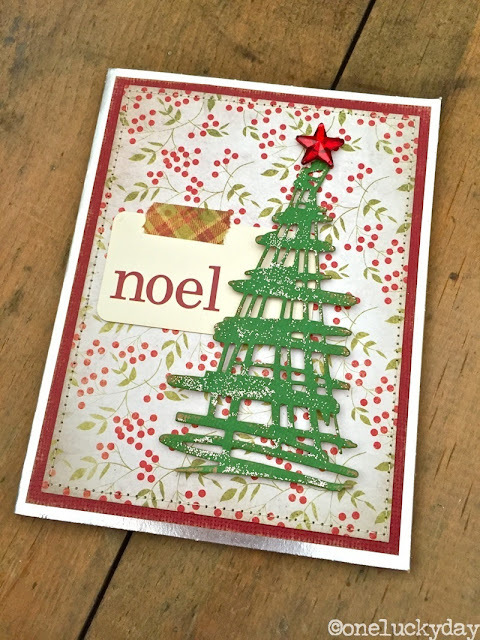 Both cards are beautifully done Paula! I love the Tumbled Glass watercolor background paired with silver on the second card! I do really love that plaid tape though. I can not wait to see Quilt Market pictures!!! Wonderful cards Paula! Inspirational as always! I love so much new Tim's releases , they are absolutely versatile!!! !